Welcome to Lane Cove Dining Week. We want you to show us how much you love eating out in Lane Cove. A vibrant Lane Cove is a great Lane Cove. In the last 18 months Lane Cove has become a foodie destination. We now have a huge variety of places to eat with so many different cuisines. However we need to support these restaurants. So take advantage of the last days of Daylight Savings and book a local restaurant. Lillah Dinner for 2 at Lillah between Tuesday & Thursday night up to a $100 value. Kasina Korean Eatery $100 voucher to be used for dine in only from Tuesday to Thursday and Sunday for Lunch and Dinner. Friday, Saturday and any public holiday are excepted. Not valid in conjunction with any promotions and discounts. The voucher is only valid for 3 months. In addition, five runners-up will each receive Lane Cove Tea Towels, RRP $20 each. Take a photo of your meal (breakfast, lunch or dinner) during the promotional period at a participating restaurant. The photo must be taken while dining in at the participating restaurant (no pictures of takeaway meals will be eligible). Upload the photo to Instagram and/or Facebook and tag #lanecovedining @inthecove and tag the restaurant where you took the photo. Competition closes midnight 30th March 2019. Winners announced 8 April 2019. Our special guest judge in our #lanecovedining week is none other than the fabulous, stylish, wonderful and talented Sarah Clare from Masterchef. Here is our list of participating restaurants and booking details. Lane Cove is loving Four Frogs Creperie. It’s a very popular place for brunch, lunch and dinner. Four Frogs Creperie is more than just a French restaurant – it’s a real French creperie, with full table service, owned and operated by four French men (the “four frogs”). Try out their sweet crepes for dessert, and savoury galettes for a delicious meal, with a glass of cider or wine and some good company. They’re always made to order and are natural, fresh and delicious. They mill their own buckwheat and make their own sauces. Four Frogs shred wheels of Swiss cheese every day, slice their own ham as well as chicken and smoked duck. All of their veggies are fresh and they cook a large volume of mushrooms daily, it’s a rather incredible feat! Their onions are cooked in the Britanny tradition of cider which gives it a great taste. Monthly specials are made with fresh produce, whilst hot food items such as their slow cooked lamb, garlic and parsley snails are all lovingly prepared in-house. Et Voila! To see the full Four Frogs menu, click here. ITC’s favourite dish: La tartiflette: Bacon, Swiss and raclette cheese, potato and onion slowly cooked in cider. Lillah is fast becoming a Lane Cove favourite. Lillah means beautiful night in Arabic. Owner Trevor Blye is reminding people that Middle Eastern cuisine is more than Lebanese or Turkish food. He worked with Nour executive chef Roy Ner to fuse Egyptian, Turkish, Israeli and Lebanese favourites into great dishes. It’s about taking traditional bringing Middle Eastern flavours together and putting a modern twist on the dishes. 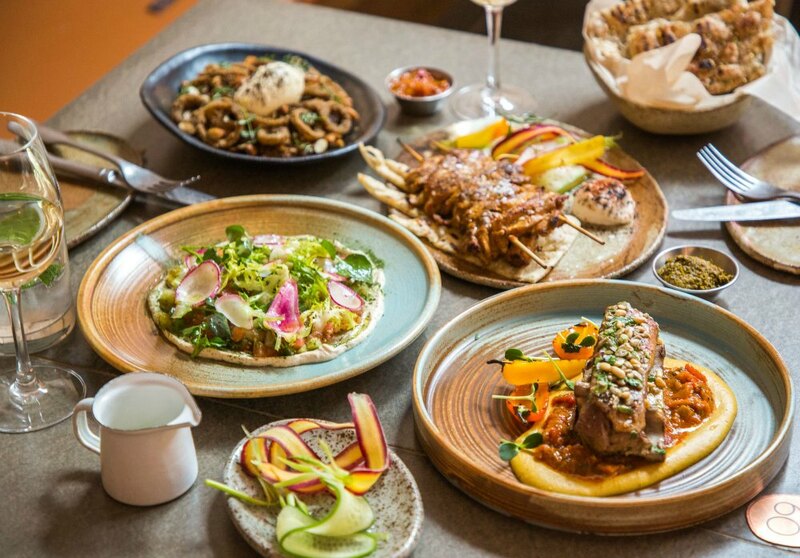 The best way to order at Lillah is to try different share plates. ITC has eaten at Lillah several times and each time tasted a different cauliflower dish – if cauliflower is on the menu, order it you will not be disappointed. There is something on the menu for everyone with a range of vegan, vegetarian and meat dishes. See what all the fuss is about and make a booking for Lillah as soon as you can. Do not leave until you have had the Nutella baklava. To see the full Lillah menu, click here. Shorties is an intimate restaurant and bar serving up food, designed to be shared, with an emphasis on fresh produce and where everything is made in house. The owners, Phil and Steve, know their stuff and know what patrons want. Phil is the co-owner of Small Bar in Crows Nest and Kirribilli and Steve, part owns The Hayberry in Crows Nest. Popular dishes are the Cheese Onion and Bacon Dip, Spiced Roast Carrots, Kingfish Sashimi and the Sunday Roast Lamb. The dishes are well priced and delicious. Of course, a trip to Shorties, is not complete without testing out the Cocktail list. Why not try the cocktail named after In the Cove: Gin in the Cove!!! If cocktails are not your thing, then try a selection of their craft beer. Shorties is the place you can visit for a pre-dinner cocktail, dinner or an after dinner cocktail. BIG NEWS SHORTIES HAS A GREAT SPECIAL ON TUESDAY AND WEDNESDAY NIGHTS – $25pp SET SHARE MENU | Available every Tuesday & Wednesday from 4pm. $20 vegetarian set share menu – Roast beetroot | Persian feta | balsamic | honey. Available every Tuesday & Wednesday evening. Slip into a cosy sofa or pull up a chair for a long dinner with friends and enjoy a contemporary menu with classic Mediterranean flavours and some amazing dishes. Award winning Head Chef Richard Slarp, from Sake, Aria Catering, Est, and Slip Inn, serves up a feast of flavours, fresh and wholesome, made with sustainable local ingredients. If you are like ITC and love brunch, then on Saturday and Sunday the Alcott serves brunch from 11am — for brunch. Choose from smashed avocado, Warm Green Bowl, with sweet potato hummus, kale, pumpkin seeds and poached eggs or Banana French Toast (to name a few). If you are looking to hold a function at The Alcott, their function menu is sure to be a hit with your guests. The Spritz bar is a big hit. Sure Cafe is a hidden gem located in the Hotel Urban just off the Pacific Highway, Greenwich offering breakfast, lunch and dinner together with takeaway options and tapas, along with a great wine list. Sure Café has a leafy outdoor terrace with retractable roof ready for all weather conditions, and a new bar area perfect for relaxing at any time of day all year round. You can unwind every afternoon enjoying their happy hour drinks from 4pm to 6pm. They also offer locals a “Love They Neighbour” discount – a massive 15% – which will have you adding them to your list of favourite cafes. Sure Café offers a range of healthy and delicious options. You can check out their delicious menu here. Encasa Spanish restaurant’s owners are seasoned restauranteurs and Lane Cove locals. Maria Barona and Francisco “Pachi” Rodriguez were so excited to bring a little bit of Spain to Lane Cove. Translating to “at home”, En casa operates with the vision of providing Lane Cove with 100% authentic Spanish food – just as you would find on the streets of Spain. Their family-friendly dinner service starts from 5pm. Popular dishes include pork and beef meatballs swimming in Pachi’s mum’s tomato sauce, the lightly battered calamari and potato bravas, fried potato covered in aioli and spicy salsa. Foogoo is a modern, fresh Asian restaurant. The name Foogoo is a play on the words Food Good (and the food is good). They serve Yum Cha and modern Chinese and also some of your favourites like Kung Pao chicken. Foogoo is owned by a Lane Cove couple who are passionate about fresh food. They make everything on site including their dumplings and sauces. Foogoo caters for a family dinner or a night out without the kids. The steamed dumplings are a hit. This is not your average suburban Chinese Restaurant. Kasina is another new kid on the block and the reviews have been good. The Korean Fried Chicken has been a huge hit. The owners live in Lane Cove and wanted to bring a touch of Korea to Lane Cove. The wait staff are excellent at recommending dishes. You must order the Bibimbap. The word Bibimbap translates to “mixed rice with meat and assorted vegetables“. Little Red Robin Restaurant is Lane Cove’s newest restaurant and it’s making a buzz. It’s a cosy, edgy and welcoming restaurant and wine bar. Their chef takes inspiration from the traditions and culinary riches of the mediterranean, this modest restaurant and wine bar aims to treat patrons by re-imagining classic recipes in a contemporary aspect. Their address is Longueville Road but it is in fact nestled in Birdwood Lane (between Crust Pizza and Birdwood Cafe). Little Red Robin is a cosy place to enjoy small sharing plates at the bar or in the dining area, accompanied by some of the most intriguing, indigenous grape varieties and unusual wine styles the old world has to offer. Their wine list is exclusively European. They promise is to keep on surprising with frequent menu changes driven by freshness and seasonality, and a wine list that keeps you coming back for more. Our favourite dish are the olives stuffed with cheese but the chocolate dome is AMAZING. So book that restaurant THIS WEEK and be in the running for great prizes. Next articleDo You Need A Will for Different Countries?